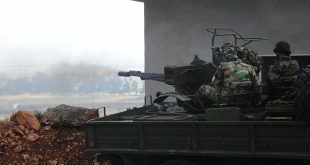 Provinces, SANA – The army is advancing in Lattakia northeastern countryside, establishing control over new areas, while its units in other areas continue operations, leaving more terrorists dead and destroying their equipment. 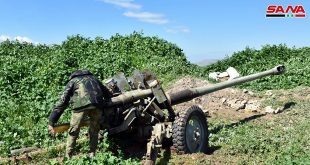 An army unit, in cooperation with the popular defense groups, established on Wednesday control over al-Marouniyat village, 1 km north of Salma town in the northeastern countryside of Lattakia province, a military source announced. Taking control of the village followed fierce clashes with the terrorist organizations last night and today morning that ended up in killing many terrorists, according to the source. Tens of terrorists fled towards Rabiaa town, near the Turkish borders. The engineering units swept the village completely for explosive devices and mines, dismantling dozens of bombs and seizing large amounts of arms and ammunition left behind by the terrorists. 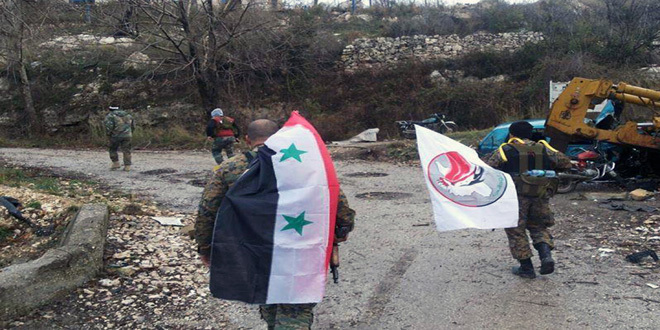 An army unit, aided by the popular defense groups, assumed full control of Bait Miro village after eliminating gatherings of terrorists to the last one. Later, a military source told SANA that Army and Armed Forces units, in cooperation with popular defense groups, established control over Sheikh Khalil and Marj al-Khokha village east of Salma town. Army units tightened control over areas in the eastern countryside of Aleppo and inflicted heavy losses upon terrorists during the continued war against Takfiri terrorism in Aleppo city and its western countryside. A military source said in a statement to SANA that the Army Air Force destroyed positions, fortifications and vehicles equipped with machine guns for Jabhat al-Nusra terrorists and other terrorist organizations during air strikes against their dens and supply routes in al-Mansoura village 10 kilometers to the west of Aleppo city. Army units eliminated dens of terrorists in Bani Zaid, the area surrounding al-Ansari station, al-Sheikh Said, Old Aleppo and Karm al-Jazmati neighborhoods. Meanwhile, terrorist organizations acknowledged that a number of their members were killed including a military leader in Jabhat al-Nusra the nicknamed Abu Obeida Atareb in the area surrounding Touman town in the western countryside of Aleppo. Field sources told SANA that army units tightened control over areas in the eastern countryside of Aleppo during special operations and established control over Ain al-Beida and the surrounding farms after eliminating the last gatherings of ISIS terrorists there. Other army units established control over the area extending between Aisha and Ain al-Beida villages which includes Aleppo’s water pump station after inflicting heavy losses in personnel and munitions upon ISIS terrorists while the rest fled away. An army unit destroyed three vehicles used by Jabhat al-Nusra terrorists on the western outskirts of Jisr al-Shughour city in the western countryside of Idleb province, sources on the ground told SANA. Seven more terrorists were killed and ten others were injured during an army operation on the eastern outskirts of Jisr al-Shughour city. Later, the sources said that an army unit carried out a special operation targeting a base for “Ajnad al-Cham Islamic Union” terror organization in al-Habbit village, which resulted in destroying 3 vehicles and killing at least 25 terrorists including Ahmad al-Barazi, Mohammad Abdelqader al-Warrar, and Mohammad Khalil. The army’s air force destroyed positions and vehicles for ISIS terrorists in al-Qaryatain city, located 85 km east of Homs city on the outskirts of al-Badiya (desert). ISIS terrorists suffered heavy losses in personnel and equipment in army airstrikes on their movements and positions east of al-Bayarat area, 10km to the west of Palmyra city. Army units carried out strikes against the dens and sites of Jabhat al-Nusra in Daraa city, destroying them along with all terrorists, weapons and ammunition inside them in al-Manshia neighborhood in Daraa al-Balad area and the area surrounding the Religious Endowments Building in Daraa al-Mahta. 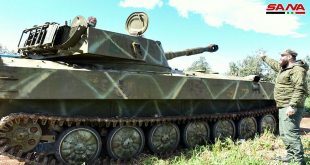 Another army unit launched special operation against a terrorist group which was moving between Rakham and al-Kark al-Sharqi in the eastern countryside of Daraa, killing many of its members, injuring many others, and destroying their vehicles. Sources on the ground told SANA that an army unit advanced in al-Sheikh Miskin city in the northern countryside of Daraa and established control over 35 buildings to the south of Tal al-Hash and the 82nd brigade camp after eliminating a number of terrorists who were positioned in it, while the remaining terrorists fled.